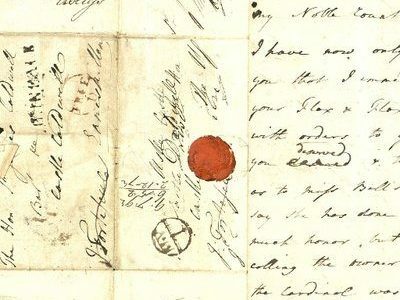 In 2017, five researchers associated with the John Rylands Research Institute (Naomi Billingsley, Florence Impens, Katharina Keim, Alice Marples, and Oscar Seip) engaged in conversations through which they discovered a shared interest in letters. In spite of working in different disciplines, time periods, and languages it became clear they all used correspondence in their research. This common interest created a desire to share and compare their experiences. From there, these scholars developed a programme of seminars and workshops that ran between 2017 and 2018 to explore methods and best practices surrounding the use of correspondence in research. This programme was generously supported through a Collaboration Grant from the John Rylands Research Institute and the School of Arts, Languages and Cultures Research Network Fund. The level of engagement and interest from scholars within the University of Manchester, and beyond, was such that conversations were soon initiated to build on this momentum and establish a long-term future for correspondence studies at Manchester. Andrew Morrison (Classics, Ancient History and Archaeology) and Douglas Field (English and American Studies) joined the team in 2018 to support this new development. Under their vision and supervision the Lives of Letters Network is currently developing into the Manchester Centre for Correspondence Studies (MCCS). For this new chapter, we are pleased to continue our cooperation with the John Rylands Research Institute and the School of Arts, Languages and Culture. With their generous support, we are able to extend our programme of events in 2018–2019 with additional administrative support to set up and manage the centre. This centre will be officially launched by the end of the academic year. Andrew Morrison and Douglas Field will be the founding directors of the Centre. This year, Naomi Billingsley is the Programme Coordinator, Florence Impens and Katharina Keim are Programme Officers, Alice Marples is Events Officer, and Oscar Seip is Web Officer.